Wilton Community Menorah Lighting Celebration – Sunday, December 2, 2018 at 4:45 p.m.
A giant outdoor Menorah Lighting at the Wilton Town Green in Wilton, CT. Event will include live music, Chanukah gelt, dreidels, and is perfect for the whole family. Free and open to all. Led by Rabbi Levi Stone of the Schneerson Center and Rabbi Yehoshua S. Hecht of Beth Israel Chabad. Weston Community Menorah Lighting Celebration – Sunday, December 2, 2018, at 6:00 p.m.
A giant outdoor Menorah Lighting at the Weston Town Center, 190 Weston Rd, Weston CT. Event will include live music, chocolate gelt, dreidels, and is perfect for the whole family. Free and open to all. Led by Rabbi Levi Stone of the Schneerson Center and Rabbi Yehoshua S. Hecht of Beth Israel Chabad. 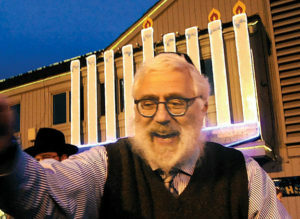 Norwalk Stew Leonard’s Biggest Menorah Lighting – Monday, December 3, 2018 at 5:00 p.m.
A giant outdoor Menorah Lighting co-sponsored by Beth Israel & Stew Leonard’s will include live music, hot latkes, Chanukah chocolate gelt, dreidels, and is perfect for the whole family. Free and open to all. Led by Rabbi Yehoshua Hecht of Beth Israel Chabad and Rabbi Levi Stone of the Schneerson Center. Westport Community Menorah Lighting Celebration – Monday, December 3, 2018 at 6:15 p.m.
Inaugural Norwalk City Hall Menorah Lighting – Thursday, December 6, 2018 at 5:00 p.m.
Will include live music, hot latkes, Chanukah chocolate gelt, dreidels, and is perfect for the whole family. Free and open to all. Led by Rabbi Yehoshua Hecht of Beth Israel Chabad and Rabbi Levi Stone of the Schneerson Center.